↑ "Prozac" (PDF). Lilly and Company. p. 20. ↑ Kramer, Peter (2011-09-07). "In Defense of Antidepressants". The New York Times. สืบค้นเมื่อ 2011-07-13. ↑ Medford, Nick. "Understanding and treating depersonalization disorder". Advances in Psychiatric Treatment (2005). สืบค้นเมื่อ 2011-11-11. ↑ 8.0 8.1 "www.nice.org.uk" (PDF). NICE. Archived from the original (PDF) on 2013-09-28. ↑ Depression: The NICE Guideline on the Treatment and Management of Depression in Adults (Updated Edition) (PDF). RCPsych Publications. 2010. ISBN 1-904671-85-3. ↑ 17.0 17.1 "Generalised anxiety disorder and panic disorder (with or without agoraphobia) in adults" (PDF). NICE. Archived from the original (PDF) on 2012-10-21. สืบค้นเมื่อ 2013-02-20. ↑ "Medscape Log In". Archived from the original on 2013-04-13. ↑ รองศาสตราจารย์ ดร.ประตาป สิงหศิวานนท์, ผู้ช่วยศาสตราจารย์ ดร.จรณิต แก้วกังวาล (2554). ศาสตราจารย์แพทย์หญิงพรรณี ปิติสุทธิธรรม, รองศาสตราจารย์ ดร.ชยันต์ พิเชียรสุนทร, ed. "บทที่ 2 รูปแบบการวิจัยทางคลินิก" (PDF). ตำราการวิจัยทางคลินิก (Textbook of Clinical Research). มหาวิทยาลัยมหิดล. p. 49-51. ISBN 978-974-11-1462-7. Archived (PDF) from the original on 2015-07-07. ↑ "Sertraline prescribing information" (PDF). FDA. สืบค้นเมื่อ 2015-01-30. ↑ "Paroxetine prescribing information" (PDF). Apotex. สืบค้นเมื่อ 2015-01-30. ↑ 27.0 27.1 "National Guideline Clearinghouse | Practice guideline for the treatment of patients with eating disorders". ↑ Lane, RM (1998). "SSRI-induced extrapyramidal side-effects and akathisia: implications for treatment". Journal of Psychopharmacology (Oxford, England). 12 (2): 192–214. doi:10.1177/026988119801200212. PMID 9694033. ↑ Leo, RJ (1996). "Movement disorders associated with the serotonin selective reuptake inhibitors". The Journal of Clinical Psychiatry. 57 (10): 449–54. doi:10.4088/JCP.v57n1002. PMID 8909330. ↑ "SSRIs and Depression". Emedicinehealth.com. 2012-09-23. สืบค้นเมื่อ 2012-09-23. ↑ 37.0 37.1 Bahrick, Audrey (2008). "Persistence of Sexual Dysfunction Side Effects after Discontinuation of Antidepressant Medications: Emerging Evidence" (PDF). The Open Psychology Journal. 1: 42–50. doi:10.2174/1874350100801010042. สืบค้นเมื่อ 2014-01-30. ↑ Taylor, MJ; Rudkin, L; Bullemor-Day, P; Lubin, J; Chukwujekwu, C; Hawton, K (2013-05-31). "Strategies for managing sexual dysfunction induced by antidepressant medication". The Cochrane database of systematic reviews. 5: CD003382. doi:10.1002/14651858.CD003382.pub3. PMID 23728643. ↑ Waldinger, MD (2015). "Psychiatric disorders and sexual dysfunction". Handbook of clinical neurology / edited by David B. Vodušek and François Boller. Handbook of Clinical Neurology. 130: 469–89. doi:10.1016/B978-0-444-63247-0.00027-4. ISBN 9780444632470. PMID 26003261. ↑ "Prozac" (PDF). Lilly and Company. p. 14. ↑ "One hundred and twenty cases of enduring sexual dysfunction following treatment". ResearchGate. doi:10.3233/JRS-140617. สืบค้นเมื่อ 2016-01-30. ↑ Gitlin, M. J. (1994-09-01). "Psychotropic medications and their effects on sexual function: diagnosis, biology, and treatment approaches". The Journal of Clinical Psychiatry. 55 (9): 406–413. ISSN 0160-6689. PMID 7929021. ↑ "Antidepressant-Associated Sexual Dysfunction: A Potentially Avoidable Therapeutic Challenge - Primary Psychiatry". Primary Psychiatry (in อังกฤษ). สืบค้นเมื่อ 2016-01-30. ↑ Clayton, Anita H. (2003). "Antidepressant-Associated Sexual Dysfunction: A Potentially Avoidable Therapeutic Challenge". Primary Psychiatry. 10 (1): 55–61. ↑ Balon, R (2006). "SSRI-Associated Sexual Dysfunction". The American Journal of Psychiatry. 163 (9): 1504–9, quiz 1664. doi:10.1176/appi.ajp.163.9.1504. PMID 16946173. ↑ Goldberg, RJ (1998). "Selective serotonin reuptake inhibitors: infrequent medical adverse effects". Archives of Family Medicine. 7 (1): 78–84. doi:10.1001/archfami.7.1.78. PMID 9443704. ↑ "FDA Drug Safety". FDA. ↑ "ref2" (PDF). สืบค้นเมื่อ 2012-09-23. ↑ 57.0 57.1 Taylor, D; Carol, P; Shitij, K (2012). The Maudsley prescribing guidelines in psychiatry. West Sussex: Wiley-Blackwell. ISBN 9780470979693. ↑ de Abajo, FJ (2011). 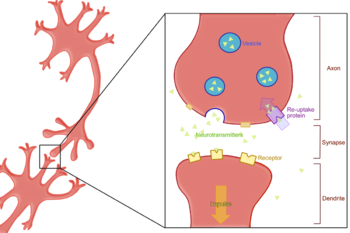 "Effects of selective serotonin reuptake inhibitors on platelet function: mechanisms, clinical outcomes and implications for use in elderly patients". Drugs & Aging. 28 (5): 345–67. doi:10.2165/11589340-000000000-00000. PMID 21542658. ↑ 65.0 65.1 "PsychiatryOnline | APA Practice Guidelines | Practice Guideline for the Treatment of Patients With Major Depressive Disorder," (3rd ed.). ↑ Renoir, T (2013). "Selective serotonin reuptake inhibitor antidepressant treatment discontinuation syndrome: a review of the clinical evidence and the possible mechanisms involved". Frontiers in Pharmacology. 4: 45. doi:10.3389/fphar.2013.00045. PMC 3627130. PMID 23596418. ↑ Hammad, TA (2004-08-16). "Review and evaluation of clinical data. Relationship between psychiatric drugs and pediatric suicidal behavior" (PDF). FDA. pp. 42, 115. สืบค้นเมื่อ 2008-05-29. ↑ "Antidepressant Use in Children, Adolescents, and Adults". FDA. ↑ "FDA Medication Guide for Antidepressants" (PDF). สืบค้นเมื่อ 2014-06-05. ↑ "Depression in adults: recognition and Depression in adults: recognition and management management (CG90)" (PDF). NICE. 2009-10-28. Archived from the original on 2015-11-03. สืบค้นเมื่อ 2016-09-01. ↑ "Report of the CSM expert working group on the safety of selective serotonin reuptake inhibitor antidepressants" (PDF). Medicines and Healthcare products Regulatory Agency. 2004-12-01. สืบค้นเมื่อ 2007-09-25. ↑ "Selective Serotonin Reuptake Inhibitors (SSRIs) : Overview of regulatory status and CSM advice relating to major depressive disorder (MDD) in children and adolescents including a summary of available safety and efficacy data". Medicines and Healthcare products Regulatory Agency. 2005-09-29. Archived from the original on 2014-12-05. สืบค้นเมื่อ 2008-05-29. ↑ "Breastfeeding Update: SDCBC's quarterly newsletter". Breastfeeding.org. Archived from the original on 2009-02-25. สืบค้นเมื่อ 2010-07-10. ↑ "Using Antidepressants in Breastfeeding Mothers". kellymom.com. สืบค้นเมื่อ 2010-07-10. ↑ "Persistent Newborn Pulmonary Hypertension". Medscape. ↑ Gentile, S (2015). "Prenatal antidepressant exposure and the risk of autism spectrum disorders in children. Are we looking at the fall of Gods?". J Affect Disord. 182: 132–7. doi:10.1016/j.jad.2015.04.048. PMID 25985383. Epub 2015 May 6. ↑ Sporer, KA (1995). "The serotonin syndrome. Implicated drugs, pathophysiology and management". Drug Safety. 13 (2): 94–104. doi:10.2165/00002018-199513020-00004. PMID 7576268. ↑ Snyder, Solomon H. "J.L. Warner-Schmidt et.al "Antidepressant effects of selective serotonin reuptake inhibitors (SSRIs) are attenuated by antiinflammatory drugs in mice and humans" PNAS 2011". Pnas.org. สืบค้นเมื่อ 2012-09-23. ↑ Ciraulo, DA; Shader, RI (2011). Pharmacotherapy of Depression (2nd ed.). Springer. p. 49. doi:10.1007/978-1-60327-435-7. ISBN 978-1-60327-435-7. ↑ Goodman, Louis Sanford; Brunton, Laurence L.; Chabner, Bruce. ; Knollmann, Björn C. (2001). Goodman and Gilman's pharmacological basis of therapeutics. New York: McGraw-Hill. pp. 459–461. ISBN 0-07-162442-2. ↑ Healy, D; Aldred G (2005). "Antidepressant drug use and the risk of suicide" (PDF). International Review of Psychiatry. 17: 163–172. doi:10.1080/09540260500071624. หน้านี้แก้ไขล่าสุดเมื่อวันที่ 22 กันยายน 2559 เวลา 15:24 น.